Looking back, attempting to properly canonize the year that was within the growing legend of Anthony Davis proves difficult. In many ways it was his year, he thrived with Team USA, conquered the internet one mind-boggling highlight after the next and emerged as an irrepressible force. In case you missed it, he’s currently having the best season of all time -- and that’s no hyperbole, if you buy the metrics. His Player Efficiency Rating of 32.22 registers as the highest ever, topping Wilt Chamberlain, Michael Jordan and LeBron James in their best seasons. By standard numbers, the 6-foot-10 Davis has averaged 24.4 points on 56.3 percent shooting with 10.5 rebounds and three blocks. The scariest number of all, presented without comment: he turns 22 years old in March. Considering Davis has radically shifted the best-player-in-the-league discourse in only a few months, it still feels premature (and almost unfair to the Brow) to call his 2014 body of work a full-fledged arrival, especially when he can still get so much better. But like it or not, playoff performance is part of the equation when evaluating the most elite players, and that's territory Davis and the Pelicans have yet to taste. Tim Duncan and the Spurs are a team that can testify to that fact. 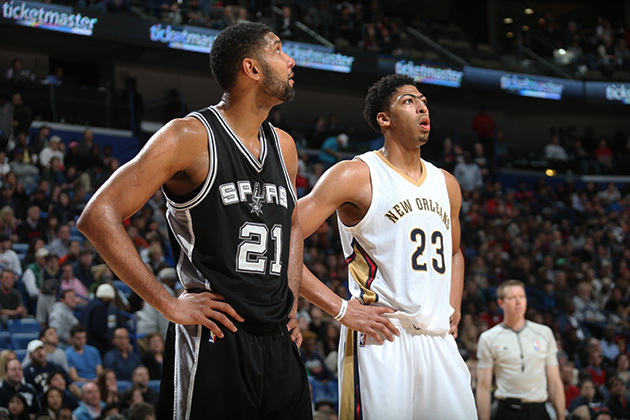 They'll face the Pelicans tonight in a rematch of last week, when New Orleans upset the defending champs. The NBA is where championships talk. Trophies dictate the conversations about all-time greats, with a star's first appearance on postseason proving grounds starting the clock for criticism. The real vindication comes with the first title (see LeBron James). Not jumping to unfair conclusions, but the odds are Davis’s immense talent will someday see him judged by those standards. ​For Davis -- still coming into his own in midst of a historical campaign -- one thing seems clear: being in the MVP discussion as well as establishing a winning tradition in New Orleans will still require some help. The Pelicans, sitting just outside the playoff picture at 16-15 in a loaded West, face the conundrum that comes with trying to win while managing any budding star: finding the optimal style of play, and the pieces best suited to surround him. Over the past several years, the Pelicans have worked to shortcut a full rebuild with a series of moves we’ll look back on as either daringly shrewd, or as a historic mishandling of the best player on the planet falling into their lap. After trading Chris Paul for Eric Gordon and spare parts in December 2011 and landing the NBA-ready Davis six months later with the No. 1 pick, New Orleans (then the Hornets) began to fast-track the building of a quality roster around their young centerpiece. It's a scheme especially uncommon in a league where stockpiling picks and assets was the norm for retooling teams before tanking ever entered the vernacular. That offseason, the team added veterans Ryan Anderson and Robin Lopez via trade, but won just 27 games in Davis’s rookie year. To the Pelicans' credit, if there was ever a player worthy of completely accelerating the timetable for contention, it's Davis. The Pelicans stuck to the scheme in 2013, flipping Lopez and Greivis Vasquez in a three-team deal to acquire mercurial scorer Tyreke Evans. Two days later, general manager Dell Demps sent sixth overall pick Nerlens Noel and a first rounder (later dealt for the rights to European starlet Dario Saric) to Philly for All-Star guard Jrue Holiday. The additions helped them to a 34-win season, but New Orleans remained far from playoff-caliber. This offseason, the Pelicans sent next year’s protected first rounder and cash to Houston to bring in Omer Asik as defensive cover. ​So far, the moves have left New Orleans in a competitive no-man’s land, the dreaded middle of the pack. They're just good enough to fight for a low playoff seed, but not bad enough for favorable draft lottery odds. Under the NBA’s cap structure, teams most frequently find value through hitting on draft picks and enjoying discounted multi-year control of young, developing talent. The Pelicans eschewed that plan by adding Evans and Holiday, bringing in both at the end of their rookie deals and later extending them to lucrative deals through the 2016-17 season. The only notable asset coming off the books next year (unless they hypnotize Eric Gordon into waiving his $15 million player option) is Asik, who Demps has said he intends to keep around. And given their place in the standings, they’re likely to be without a first-rounder in June (unless they pick either in the top three, or the 20-30 range). Davis remains under team control through at least 2016-17, and one unspoken aspect of this whole process is the team's need to have enough in place down the line to convince him of a promising future in New Orleans. He'll spark an unprecedented bidding war unless the Pelicans ink him to an extension first. Though they can still match any offer, control his bird rights and can offer him an extra year at the maximum salary, crazier things have happened in recent memory than a superstar skipping town. They'll want Davis happy by the time he begins to really ponder his future, and there's no way the possibility of him bolting at some point doesn't occasionally haunt the dreams of every team executive, if not the city's entire basketball-loving population. ​Locked into the hand it has dealt itself, the Pelicans must now optimize its strategy around the walking video-game-cheat-code that is Davis. New Orleans' offensive scheme tends to vary depending on which of its big men is flanking him. Asik, a rebounding specialist, helps on defense, but the 7-footer frequently struggles to score. Anderson, a threat from anywhere on the floor, especially three-point territory, spreads the floor effectively but his presence forces the taller Davis to guard opposing centers. The unique platoon hinges on the versatility of Davis, who in his third year in the league now scores confidently from all over the court, knocking down a 47.6 percent mid-range clip. 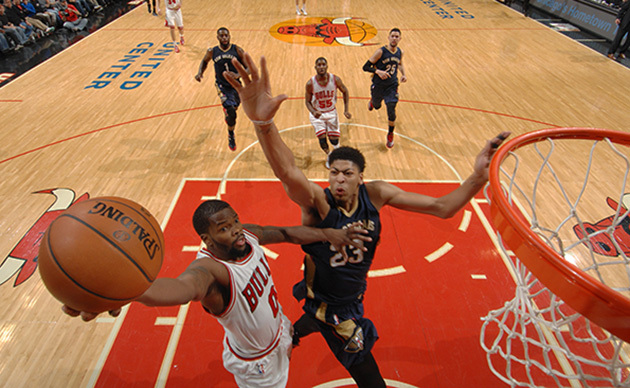 As Davis continues to develop, the Pelicans must evolve their scheme around his skill set. So far, those adjustments are a work in progress. In terms of team identity, the statistics would suggest otherwise. The numbers don't support fluid ball movement, but a lack thereof. Per NBA.com, New Orleans averages the fewest offensive touches per game through its first 30 contests (each time a player gets the ball within a possession counts as a touch), and the second-fewest total passes per game. They’re a bottom-half team in terms of assists, but more telling is the fact the Pelicans are dead last in secondary assists per game (passes leading to successful dimes), averaging almost a full hockey-assist less than the Lakers. Some type of modified dribble-drive offense makes sense for this group, with Holiday, Evans and Austin Rivers all capable of getting shots at the rim, but if Williams seeks to run a ball-moving system, greater changes are needed. ​Luckily for the Pelicans, the luxury of having Davis, an efficient scorer who doesn't dominate the ball, allows for this type of guard-heavy attack. They've pounded drives into the paint accordingly, to mixed results. Evans’s 26.1 percent usage rate coupled with 42.4 percent shooting from the field has been problematic. Though he’s certainly talented, and puts up impressive counting stats (16.7 points, 5.5 assists, 5.4 rebounds), look at the ugly shot chart above and you'll have a hard time arguing why Evans should be shooting this much. He’s still just 25, but with three years left on his extension and a well-earned reputation for chucking unconsciously, it’s tough to say what would be harder: convincing Evans to rein it in a little, or trading him. The Pelicans are likely saddled with him for the next few seasons, for better or worse, so something's gotta give here. Holiday, 24, has recovered from a stress fracture in his tibia that ended his '13-14 season. His playmaking has been a bright spot, with an assist-to-turnover ratio just over 3:1. He’s shooting slightly better, at a pedestrian 45.2 percent, with a usage rate of 22.6. Also a tough on-ball defender, you’d like to see Holiday take on an increased role and even more of the playmaking duties, particularly if he assumes them from Evans. The jury’s still out on the backcourt duo New Orleans gave up so much to assemble, but as the steady Holiday moves closer to his All-Star form, he looks like the team's most useful non-Davis building block. ​The Pelicans are third in the league in drives to the basket per game, but shoot a middling 45.3 percent on those plays, which is unsurprising given the tendencies of their guards. Here lies the added value of Davis, and to a lesser degree, Asik, with the size and length to clean up those mistakes around the basket. The Pelicans are one of the league’s better teams on the boards, and though they’re in the middle of the pack on a per-game basis, New Orleans leads the NBA in contested rebounding, a testament to the effort of its bigs. 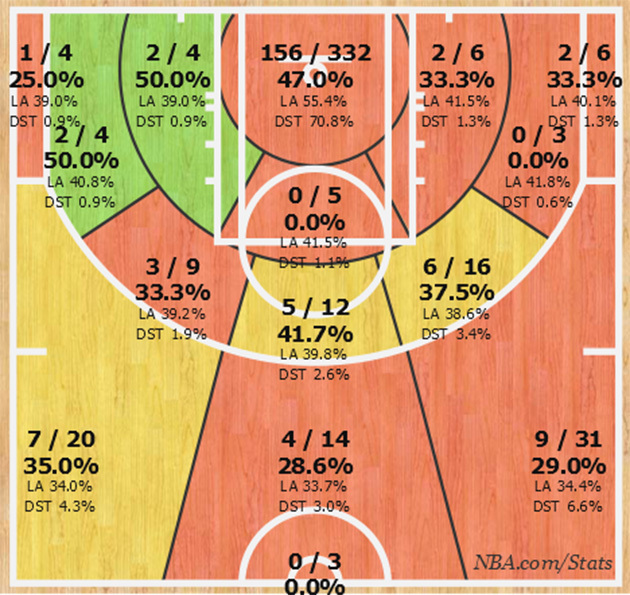 Despite his stretch-four tag, Anderson has long been an underrated grease man on the offensive glass. The trio makes a lot of sense with the style New Orleans seems to want to play. On the other side of the ball, despite the Pelicans fielding two of the league’s most highly-regarded rim protectors, opposing teams have shot 47 percent from the field. And here's a bizarre fact: opponents actually shoot more frequently at the rim against New Orleans than any other team in the league -- and convert a glaring 53 percent of those looks. The problem can’t lie entirely with Davis and Asik, but that's an area greatly in need of improvement for the Pels to make winning headway. There's not a quick fix here, but improving the perimeter defense on a tight budget this offseason wouldn’t hurt. Though it appears Williams’s philosophy works mostly to the strengths of his players, overall execution has been inconsistent. This is essentially a four-man offensive attack, and it's not enough to contend. Former star guard Eric Gordon, due to return as soon as next week from a shoulder injury, can’t be counted on for much immediate assistance, and no other help is on the horizon. Unlikely to possess a first-round pick in June, the Pelicans have no reason not to give it their all for Davis's first ticket to the playoffs. But a guaranteed tough matchup makes advancing past the first round unlikely. Currently trailing Phoenix for the eight-seed, plus a healthier Oklahoma City team nipping at its heels, New Orleans' odds of getting to the postseason don't look great. To sum it all up, this Pelicans season isn't really about this season. The team's core is locked in, and given that, any signs of improvement as a unit over the next several months bode especially well for the future. They'll have to get clever in the offseason to add the role players they need, but this team could be more than a middle-tier curiosity very soon. Davis still has plenty of time before the scrutiny that comes with his team's struggles falls entirely on his shoulders. If he continues to post groundbreaking numbers like this, how much can you really nitpick? As he becomes one of the league’s signature stars and the spotlight magnifies accordingly, it will fall on New Orleans to put its superstar in the best position to win as soon as possible. Make no mistake: despite the pressure that comes with it, the opportunity to build around him is the type of problem 29 other teams would love to have.